“I discovered Salt Magazine when I moved to NH. I loved the stories created by editor Pam Wood and her young students on the Maine coast. They could characterize a fisherman with a turn of phrase and a camera-like focus on the work of the fisherman’s hands. You want to know how to stitch a bait bag? Make chowder? Salt stories made you feel like your were hanging out with the people and could learn their skills. I found myself working in Portland, Maine at the Reiche Branch Library and later teaching writing at that very place, the Salt Institute for Documentary Studies that Pam founded. Since my early work in Vietnam, I’ve followed the lives of refugees who bring their families to the U.S. for safety and so their children can go to school. I worked in Lowell, Massachusetts and wrote about a young girl from Cambodia in my novel If the Tiger. In 2001, in my Portland days, I saw that Catholic Charities was continuing their work to resettle refugees from Sudan and Somalia in the area. Many newly settled families found Portland to be a safe, small city and a number of families who had settled in Atlanta and other cities moved to Portland in secondary resettlement. I was in a place now to meet people from Sudan in the first months of their lives in the U.S.
As I built relationships with new friends in Portland from Sudan, I wanted to write about teens and the dance they were learning as they became both American and Sudanese. Or -as Viola in the novel says – she is neither, anymore. She’s creating something brand new as she combines her two cultures. I explained to elders in the community that I wanted to write a book about the teens as they made their homes in Maine. The elders very much wanted this story to be told and shared their experience and struggles with me. I approached the work as Pam Wood and her students might have done, spending a lot of time with families and learning how they spent their days, about their art, the work of their hands, the music they love, the stories they tell. However, I used this research method to create a novel. 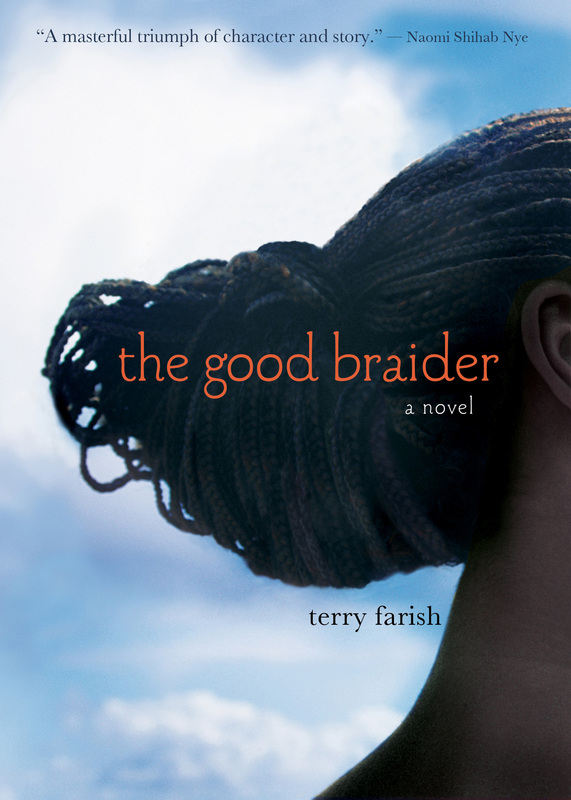 The Good Braider is fiction and based on research and dozens of stories I recorded. I learned so much about the U.S. as my new friends interpreted our ways. (“You Americans work all the time. You don’t talk to each other.”) For more than two years, I hung out with one family in particular. 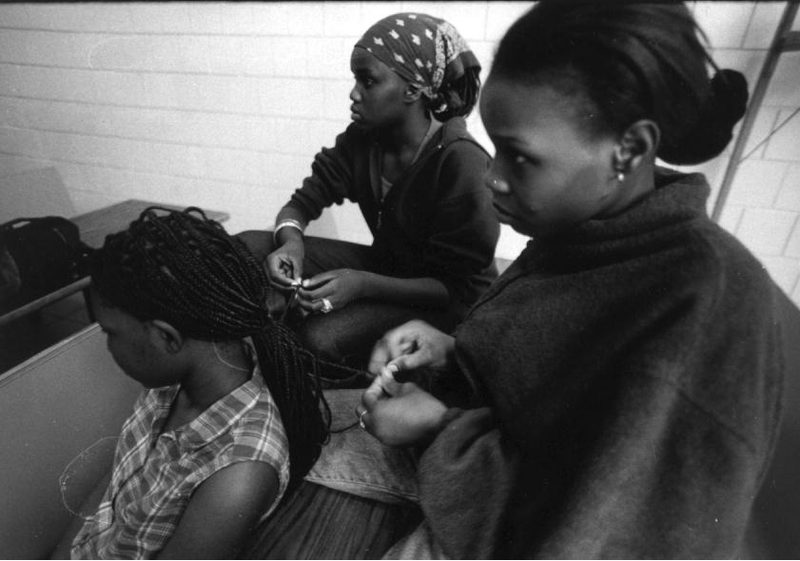 An art form of the girls was the art of braiding hair. Braiding micro extensions into hair is art in art’s broadest sense. It takes six, seven, or more! hours to tie in all those tiny extensions and those hours are full of music and talk and gossip and education, taking care of the little kids, passing on lessons learned, dreaming of the future – the whole culture unfolds in those hours of braiding. I am grateful to my Sudanese friends who cooked for me, told me stories, let me go to work with them, brought me to meet their teachers, taught me how to make sambusas, welcomed me into their lives. Invited me to stop working and talk with them. Kate Philbrick, my photographer colleague at Salt, took photos of a new American family from Sudan in Portland. You can view Kate’s documentary photos here.